The Northern California Cherry Blossom Festival food area is a crowd favorite. The block along Webster Street, between Post and Sutter, is solely run by non-profit organizations. 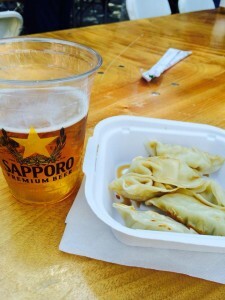 You can find the best of Japanese outdoor festival foods prepared by heart of the Japanese community. All proceeds benefit each organization. The Sapporo Beer Garden serves thousands of visitors every year. Beer flows from a few serving points at the Festival. Enjoy a beer with your food and listen to the music beating from the Webster Street Stage.